We know how a bar magnet looks like. But in the case of the magnetic fields surrounding it, we can't see them with our physical eyes. Like this, the human being also has some subtle energy fields surrounding the physical body which according to the Vedas are called Pancha Kosas. 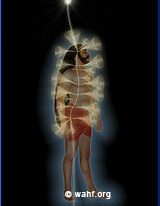 Chakras are considered as Energy centres of Pranamaya Kosa (Energy body). Each Chakra is connected to different parts of the body and they pass certain types of energies to the physical body through nadis (meridians). In Yoga and holistic healing lots of importance is given to the Chakras and there are many practices to keep them in a balanced state. Initially I used to suffer from obsession of negative thoughts. After doing meditaiton instead of flowing those negative thoughts, I asked my self why these negative thoughts are continuing? That insight during meditation solved my problems by 95%, now I am feeling well both physically and mentally. And I hope that my psychological state will improve through Heart Soul Meditation. Thanking you again. When we ask one person, he might say “I am this body”. Another person might say “I am this body and I have some thoughts, feelings and emotions”. And again somebody else might say “I am this body and I have mind and Soul”. So how can we actually define the „Human Being“ when depending on whom we ask, we get different perceptions of what the Human Being is? According to the Vedas, in this visible world, all physical matter is created by the combination of Pancha Bhootas (five elements) – also our physical body with its organs etc. - but there are things which we cannot see with our eyes. Let's take the example of a bar magnet: We can see the magnet but the magnetic fields surrounding the magnet are invisible to our eyes. Similarly, every human exists not only of the visible body but possesses some subtle energy fields along with his physical body. The physical body is in physical level and the subtle bodies are in cosmic level which is why we can't see them with our physical eyes. By doing the Heart Soul Meditation, one can restore the balance between the physical and subtle bodies. One of the things that most meditations have in common is the fact that they are effectively calming the mind. While we might feel that during a good night's sleep we are actually doing just that, as a matter of fact, we are only giving rest to our body as we might still have thoughts and feelings which come as dreams. While universal vibrations always try to protect and heal us from the various problems of our daily life, negative thinking, worries and other psychological imbalances act like barriers for receiving this universal support. When we do this Heart Soul Meditation, we are calming the mind and clearing the blocks in our subtle energy fields, thus allowing the flow of higher and healing energies from the subtle bodies to our physical body. 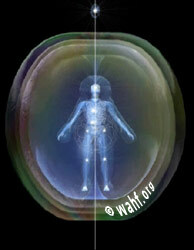 As we know now, these subtle energy fields (Energy Body, Astral Body, Mental Body and Causal Body) are in cosmic level. In order to clear the blocks in those subtle bodies effectively, we need to use one type of energy which is superior to the cosmic. This is called microcosmic energy and the Heart Soul is one such microcosmic energy centre and part of the “Complete Human Being”. Find out more about this microcosmic energy centre in our next topic „Heart Soul“.